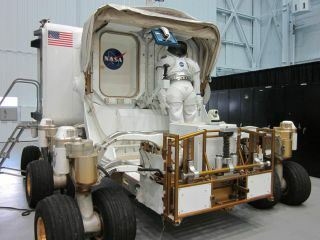 A mockup of NASA's next generation moon rover, the Space Exploration Vehicle (SEV), on display at the agency's Johnson Space Center in Houston. The SEV has since been converted into a wheel-less vehicle designed for visiting asteroids. The re-election of President Barack Obama has kept NASA on track to send human explorers to an asteroid, and that means work on a 21st-century spacecraft to fly astronauts to the target space rock and hover nearby — or maybe even pogo off its surface — will go ahead as well. As of 2010, Obama has challenged NASA to get astronauts to an asteroid by 2025, and on to Mars by the mid-2030s. Whether or not the space agency can stick to that schedule largely depends on its future budget, experts say, but regardless of the pace, work on the asteroid mission is already under way. The Multi-Mission Space Exploration Vehicle (SEV) is a prototype that began its design life as a wheeled moon rover. When the president shifted NASA's focus from the moon-oriented Constellation program set up by the Bush administration, the space agency adapted the SEV to meet the needs of an asteroid mission instead. Prototype versions of the sled and crew cabin are being built and tested at NASA's Johnson Space Center in Houston. There, engineers have set up a surface that resembles an air hockey table for the vehicles to float on to simulate frictionless motion in microgravity. "We're just trying to simulate the feeling of weightlessness in two dimensions to simulate what three dimensions will be like," said Hugo Martinez, project manager for the SEV's sled at Johnson Space Center. Transitioning the SEV from a moon-bound craft to an asteroid-targeted vehicle require significant changes. Not only can the spacecraft not drive around on the surface of an asteroid — it probably can't event land there. "It won't land like it would on the moon or any other planet because asteroids are so small there's no gravity to speak of," Martinez told SPACE.com during a September interview. "So we're kind of docking with it." A NASA engineer works on a mockup of the sled component of the SEV spacecraft, attaching wiring onto this preliminary prototype. The engineers have fitted the prototype SEV with robotic arms that may be able to grab onto the surface of an asteroid. "Alternatively, we're carrying enough propellant onboard that if you can't dock, you're going to have to maintain relative attitude to it going around it. It's got to be sized to basically hover over the surface in a lot of different positions. That drives a completely different design than a conventional lander." Furthermore, if neither of these "docking" systems works with the asteroid in question, the scientists are thinking of another option: a pogo stick. A "stinger" protruding from the front of the spacecraft could be used to spring around the surface of the space rock. "When you get to an asteroid, instead of having to hover all the time, you'd kind of softly bounce off of it. It's pulling you in with a wimpy amount of gravity and then you can just kind of balance on top of it." This idea needs some testing out, so the engineers plan to barricade the trial sled inside a small area with a model asteroid, and use the air hockey floor to try out pogo-ing. And the stinger isn't the only element of the SEV that needs work. Many of the design features of the vehicle are in the early stages, and the details still need to be tested. If the current schedule holds, NASA could test-drive a version of the SEV at the International Space Station in 2017. Although pogo-ing off the station is not in the offing. "We would take just the sled, maybe with a cabin, up to the space station," Martinez said. "We would do stuff there to build our confidence" with the design. Although there are many unresolved details, the basic technology required to build the SEV is within reach, he said. The political and funding future for the program is much more of a risk than the technology itself. "The biggest problem is political, is not knowing which way you're going," Martinez said. "Technically, I think we really don’t have any big challenges. If we're given a goal and enough money to do it, I think we can do it." The plan would be to send an unmanned precursor mission to an asteroid first, with the sled component of the SEV alone, equipped with scientific instruments to do preliminary studies. If that went well, humans would follow in a cabin-sled combination. Astronauts will likely launch on a new heavy-lift rocket being developed called the Space Launch System, inside a capsule under construction called Orion. Once in space, Orion could dock with the SEV to allow astronauts to transfer over. Another real challenge for such a manned mission to an asteroid is the issue of protecting humans from radiation. No technology currently exists to adequately shield a spacecraft from the harmful radiation in space without weighing a space vehicle down prohibitively. "That continues to be the biggest hurdle to really going to an asteroid," Martinez said. The unmanned precursor mission, at least, shouldn't be too hard. "We've got the technology to do it. It'll take money and it'll take time," he said. Follow Clara Moskowitz on Twitter @ClaraMoskowitz or SPACE.com @Spacedotcom. We're also on Facebook & Google+.